I have officially been writing about potty training since April (that’s 8 months if you’re counting) and I am happy to announce that Lil’ B is daytime potty trained! I think we actually achieved this success several weeks ago but it’s taken me this long to admit that we’re done with cloth diapers. Over the weekend as I was revamping the tots room I cleared out all of the cloth diapers and put them in laundry baskets until I could figure out what to do next. Tonight I organized them and placed them into pretty piles and matched up all of my orphaned inserts. Now, what should I do with all of these beautiful fluffy diapers that I’ve collected over the past (almost) three years? I have so many options on what to do with them. I know I could find good homes for all of them in less than 24 hrs but I’m picky (stingy, clingy, etc) and want to make sure I make the ‘right’ decision. Help me decide where I should send my fluff!! Friends and Friends of Friends! Remember my neighbor who just switched to cloth diapers? I know she could use more and hasn’t had much luck finding them on Craigslist locally. Also – she told me that one of her friends is interested in switching to cloth too. At least I would know who they are going to if I passed them along to her. I also have several friends who are only using cloth diapers part time and/or who have just given birth and not yet committed. Resale – I have a LOT of diapers! I still have a few that are brand new. I know my husband would be happy if I sold them all and made a little money but my heart is telling me that if I sell them I should do something good with the money instead of being greedy and keeping it all to myself. You can resell diapers online at DiaperSwappers, DiaperPin, Craigslist, Ebay, Facebook groups, and so many other places. I’m telling you…resale value on cloth diapers are crazy! Giving Diapers, Giving Hope – a new non-profit organization that is always looking for cloth diaper donations for low income families. I meet Emily this year at the ABC Kids Expo and they seem to be headed in the right direction with their organization and I’d be happy to help out – even if it’s only a little bit. Donate to local low income families. Our church has 2 organizations that we support that I think would benefit from cloth diaper donations. I still need to talk with some of my church friends who coordinate their needs and see how many infants/toddlers they actually have at this time in need of diapers. This one will take a bit of effort and time to organize but I would really like for most of them to stay local. Holding on to them for a very strange collection! I’m a pack rat and don’t let go of things easily. I won’t make a Hoarder’s episode or anything but I do save stranger things. I could call them samples for work – reference for when people ask about a specific feature of a diaper. But I think my husband and my limited storage space would rather I let them go. Don’t worry, I have lots of pictures of our stash! Whichever option I decide to go with I know that my diapers will continue to be loved for years to come. I think the hardest part for me will be parting with the diapers for good. Lil’ B is growing up too quickly and she’s our last baby. I’ve grown so in love with the cloth diapering community that I don’t want to let go just yet. I mean, I still work in the industry so I’m not going anywhere but if I don’t have cloth diapers in the house any longer will I lose my passion for them? Or will I be replaced in my role as a cloth diaper blogger and advocate? As I wipe away my tears of insecurity I’m comforted knowing that I get to keep about 10 of them for nights. Lil’ B still wakes up wet so we’re not ready to get rid of all of them just yet. Now, which 10 should I keep? I think donating at least half of them would be really nice. That way you could still make money off of some of them…. (maybe put the money towards your kids college fund? Or a charity like March of Dimes, or a cloth charity. )..all your ideas are good and I’m usually indesicive so I’m not the best in answering this haha………maybe ask lil’b what should happen to the diapers? I don’t envy your decision right now. At all. I agree that donating or giving some of them away is a great option. 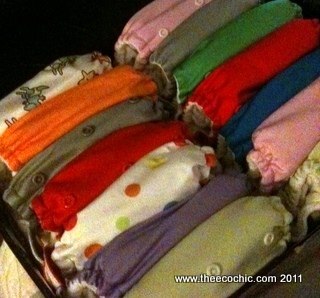 I know how excited I was when I received a few pre-loved cloth diapers from my SIL’s friend! So sad that this part of your journey has ended. 🙁 But I’m glad that you’ll be sticking around for a while anyway. Jeniffer @ Sisters ‘N Cloth recently posted..Getting Back on My Feet… Or Trying To. Don’t you find it interesting how people that CD are almost a little sad when their kids PL? I don’t think anyone ever feels that way about getting out of disposables. Goes to show how fun using cloth is. I am going to be the exact same way when Kyliana potty trains, but thankfully we still have another year or two. I also vote for letting your daughter decide what to do with the diapers, afterall they are “hers”, lol. Best wishes, you will alway be my “cloth diaper blogger idol”.